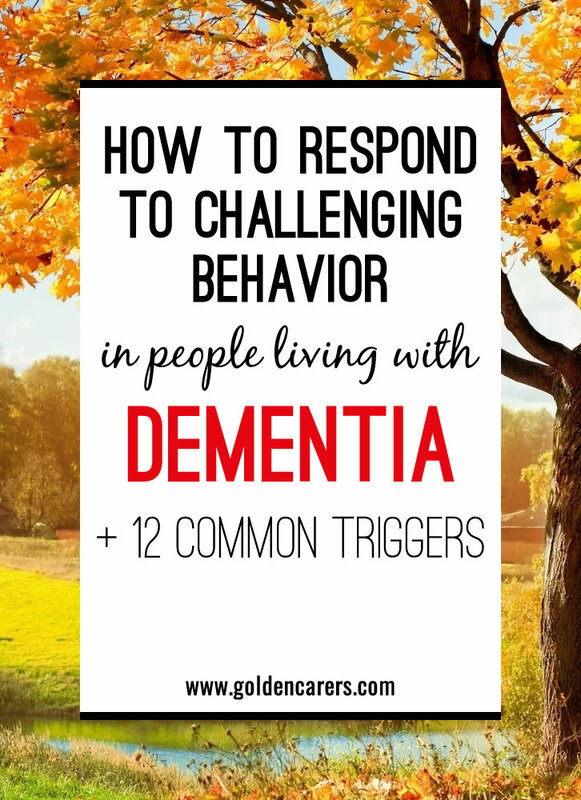 Challenging behavior is common in people living with dementia and is considered one of the most difficult issues facing staff in residential care and caregivers at home. It is important to try and understand why the person is behaving in a particular way and remember that it is the behavior that is challenging and not the person. I also have a resident who spits constantly some days are worse than others but I was surprised to see that during her 80th birthday celebrations, her family came in and she didn't spit at all! I'm not sure if the cards will help, will certainly give it a go...also other residents find it hard being in the same room as her so she spends a lot of time in her room. I wish there was something I could do to change her environment. Really appreciate any help with this. HI everyone, I am a activities coordinator in a hospital looking after the longterm elderly conditions patients. On average 3/4 of my patients have Alzheimers/dementia and the majority are looking for lost handbags, keys, purses, hankerchiefs, wallets. What I do is go to all the charity shops in my area and stock up on handbags, wallets, purses, and ask my friends if they have any spare keys. I now don't have any problems with them looking for things. I have even picked up a few cheap rings, watches and bracelets. It makes the patients so happy. Hi Effie, Would a writing board help this client to communicate or perhaps a coaster sized book of pictures for him to be able to point out what he is trying to convey such as a picture of a toilet or drinking cup. Just a thought. Hello, We have a 40 yrs old mainly non-verbal male client, intellectual impairment/dual diagnosis who is Spitting. When going out he will spit a lot in the car and at the carer. Spits on changeover of carers, mostly on his shirt but sometimes at carers and people. It appears at times attention seeking behaviour or anxious/excited about something, his way of communicating..
What would be a way to handle this behaviour..? Hi, I have read the above articles and am just wondering if it might help finding out a particular item this lady client keeps stating is missing, e.g. a watch and getting hold of a cheap one which might re-assure her or is this going to open up a can of worms? It is common for people living with dementia to be suspicious of neighbours and staff. Sometimes they come up with unreasonable accusations. You may try validation therapy; ask questions about the item that is missing; how she used it, for what purpose, if the item reminds her of someone and so on. If this fails, use some strategic distraction; something that worked in the past or invite her for a game or visit someone she likes. Unfortunately, sometimes nothing works and they stay miserably for a while. You must remember that it is the illness that brings this sort of behaviour; they can't help it. Hi Lee, I am not an expert, but think that if a person was a bona fide narcissist before the onset of dementia they wouldn't know how to carry on the trait after diagnosis. They may carry on for a while but the illness is relentless and sooner or later cognition and memory are impaired. The illness is known to affect people in different ways; some cope better than others. Every residential care facility has challenging residents. The only advice I can give you is to take a break if it is all too much. Don't feel guilty or embarrassed. It is better to take a break than lose patience with them. All the best! Your reasoning is based on the person having behavioral challenges as a result of the disease. You don't take into account the fact that the person may have been a bona fide, literal narcissist before the onset of dementia; and, their behavior is an extension of who they really are. What then? Hi I am working wit a lady with dementia going through the stages. Memory really bad. How do I help her when she is adamant that personal belongings are not there....they actually have not been around for 30 odd years. It's a constant asking process an I do not know what to say or help her reason. these things have not been with her since year dot. What would you suggest for a male person in his 80's who has dementia,is not ambulant. He will not sit for any length of time in a chair or bed. He keeps trying to get up and walk. I have tried various distractions to no avail, he is not interested in any activity at all. Every time this person tries to walk he falls over and injures himself.